This buffing system from Beall Tools comprises three 200mm buffing wheels â€“ one for tripoli, one for white diamond and a third for wax. Also supplied are sticks of tripoli, white diamond and wax along with an adaptor for mounting the wheels. Each of the buffs has a different composition. The tripoli buff is a stiff all linen fabric; the white diamond buff has linen plies interspersed with soft cotton ones, and the wax buff is a very soft, all cotton flannel fabric. The aluminium adaptor needs to be mounted onto either a motor shaft or your lathe. For my tests I held the shaft in suitable chuck jaws although a Morse taper is available as an accessory. To use, mount the adaptor so that the wheels rotate counter-clockwise when viewed from the outer end of the shaft. The buffing wheels can then be spun into the threaded end of the adaptor where the direction of rotation tightens them as they rotate. 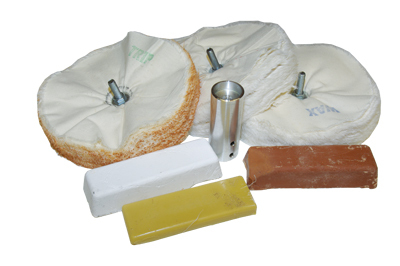 Before use you should prepare the wheels by holding a block with abrasive against them, taking off any loose threads. The work needs to be sanded smooth as normal prior to buffing. Personally, I normally sand to 400 or 600 grit. As would be expected, the finer the finish the higher the resulting gloss. I worked from bare wood, but it is possible to apply a finish such as an oil or sealer first. Before using the system, I would recommend allowing the finish to dry overnight. The buffing process begins with the tripoli wheel and the red tripoli compound. Initially, apply a generous application of compound onto the spinning wheel â€“ below the centre of the wheel. Care should be taken not to apply so much pressure that either the compound or workpiece is pulled from your grasp. Begin to buff the workpiece and work all over the surface applying more tripoli if required. The compound fills the grain and starts to polish the surface. The second step is to use the softer white diamond compound and wheel. The same technique is used and the work is lightly buffed all over. The final step is to apply the Carnauba wax via the flannel wheel. 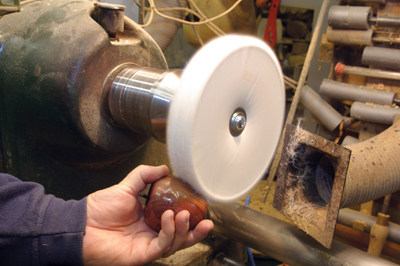 Apply a little of the wax to the rotating wheel, and buff the workpiece again on the wheel using the same techniques as before. Ensure you wear eye protection and a suitable dust mask. The new wheels will initially throw off loose lint and threads. The tripoli compound carries a warning that it may cause a temporary irritation to eyes, ears, nose and respiratory tract. If a Morse taper mount is used then I would suggest that the tailstock should be brought up or a tie bar used through the hollow headstock spindle, in order to prevent the taper self ejecting whilst in use. The instruction leaflet provided is excellent and comprehensive. I must admit to having used the compounds many times and I am already a convert. Providing the wood has been suitably prepared the system provides a high gloss finish that will withstand a good degree of handling. Should it be required, the finish can be reapplied easily at some point in the future. For smaller work, an additional kit is available comprising 50, 75 and 100mm buffing wheels. These buffing wheels are well made and easy to use. They enable you to refine and manipulate your work and the surface of many types of applied finish. Many people have yet to experience the joy of buffing work and the ease and the speed with which you can achieve results. I have no hesitation in urging you to try this system for yourself.